In the Holiday 2008 issue of Details, we learn — by way of writer Jeff Gordinier — that Keanu Reeves has a hankering for a good sandwich. The two gentlemen embark on interview-turned-quest that leads them on a forty-five minute drive from West Hollywood to Santa Monica in search of Bay Cities Italian Deli & Bakery, the goal being to partake in “you know, a good sandwich” with “the shredded lettuce.” The actor seems to be on a journey to find a meal that exists on a different level, hopefully with that something special that you can only seem to get in Chicago but that ought to exist somewhere in Los Angeles. I can relate, having cravings for food that friends and family have recommended to me over the years and not having near the amount of time or money to get to all of them. When it comes to sandwiches, that something special can be had in Rochester, New York at a shop called DiBella’s Old Fashioned Submarines. I discovered DiBella’s in 1999, long after its inception in 1918. Whether with friends, out-of-state visitors, or by myself it was a frequent fixture throughout my time at college. In my subsequent travels up and down the East coast, I’ve yet to find a better sandwich. Not in Philadelphia. Not in New York City. Not in Chicago. Not in the stellar roadside shops in Nowheresville, New Jersey. Not even the super-sweet Capriotti’s Sandwich Shop last weekend in Wilmington where I was introduced to the The “Bobbie” for the first time. 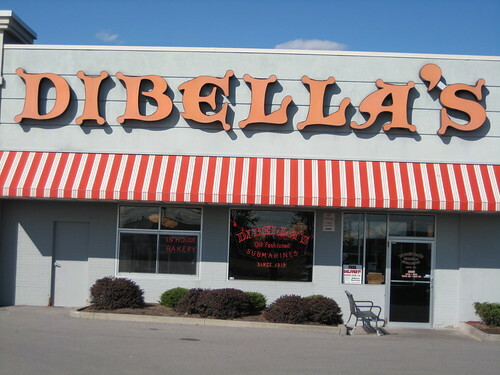 DiBella’s bakes their own bread on the premises throughout the day in large old-school ovens. The result is a soft sub roll, whose delicate browned crust breaks away perfectly with every bite (unlike some subs where you end up tearing the whole roll apart with the first bite). Your order is assembled behind a shoulder-high counter by one of a half-dozen sandwich makers. Unlike some other more corporate establishments, your food is prepared and wrapped from start to finish by one person. I like that, rather than having my food passed across the cutting board. Condiments are included in the price, be it lettuce (shredded, Mr. Reeves), tomatoes, olives, peppers, their signature oil, or anything else. There’s slight charge if you want any of them warmed up, but I think they’re better as is. Prices are extremely reasonable and I’ve found that a small sub will more than feed me for lunch without much else, perhaps a pickle. Aside from the warming, all of the subs are the same price. 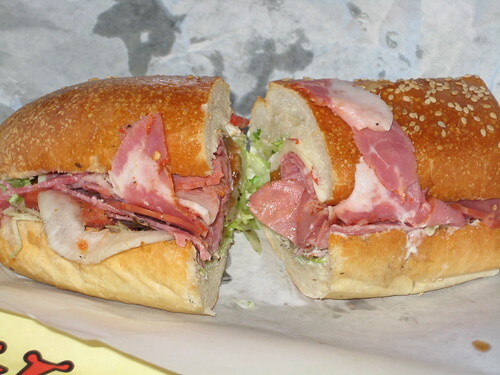 The small Godfather sub (pictured above) consists of genoa salami, capicola, and spicy ham. If that doesn’t work for you, chances are something on their menu will. Keanu Reeves might even like it. While I don’t doubt the quality of said sandwich, especially never having tried on, I contend that the Muffaletta sandwich from Central Grocery in New Orleans to be not just the best sandwich on the planet, but quite possibly one of the best foods overall. Eating one of those things is like tasting God, and knowing that He is delicious. Sweet merciful crap, do you moderate EVERY comment? Just whitelist me or something, so I can finally start telling everyone who reads your blog about these fine leather jackets I have for sale. Oh, I see. You must moderate comments with URLs in them.